Each MARINE Algae toxicity test contains all the materials necessary to perform two growth inhibition tests with the marine diatom Phaeodactylum tricornutum. Easy to follow instructions and detailed illustrations are provided in the kits for the conduct of range-finding and definitive tests. 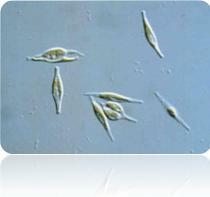 An algal inoculum composed of diatoms in steady state condition is included in the kits. This special inoculum can be stored for several months. The micro-algae needed for the conduct of the assays are obtained by 3 days pre-culturing of theinoculum. · The MARINE ALGALTOXKIT is a 72h assay based on growth inhibition of the diatom test species, with calculation of the 72hEC50. · The uniform high quality diatom inoculum provided in the kits is produced in strictly controlled conditions. This precludes the variability associated with year-round maintenance and subculturing of laboratory algal stocks as is often the case in conventional algal test procedures. · Highly uniform quality of the micro-algae growth medium is achieved by simple dilution with deionized water, of the concentrated solutions of selected mixtures of chemicals included in the kits. · A Quality Control Test with a reference chemical is described in detail, for accuracy and reproducibility check. · The MARINE ALGALTOXKIT makes use of unique disposable “long cell” exposure chambers (10 cm path length), which also serve as measuring cuvettes for direct determination of algal growth by optical density measurements. · Labour time for testing is significantly reduced by the direct measurement of algal growth in the long cells in a (suited) spectrophotometer. · Shelf-life of the special diatom inoculum is guaranteed for several months when stored properly, reducing test scheduling constraints. · Tubes with diatom inoculum, concentrated algal growth medium and toxicant dilution medium, long cells and holding trays. · Specification sheet with batch number of the diatom inoculum and the growth and toxicant dilution media. · Rapid and practical set up of the diatom pre-culturing from the steady state inoculum. · Rapid set up of the tests and simple handlings and scorings during the bioassays proper. · Daily scoring of the optical density of the micro-algae in the long cells takes less than 15 min. · A floppy disc for easy data treatment of the results can be obtained on demand. · Comparable to the sensitivity of the algal growth inhibition test with diatoms from laboratory cultures. 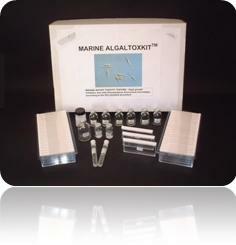 · The MARINE ALGALTOXKIT toxicity test adheres to the “Marine algal growth inhibition test with Phaeodactylum tricornutum” prescribed by the ISO.